To summarize and report results from separate worksheets, you can consolidate data from each into a master worksheet. The worksheets can be in the same workbook as the master worksheet or in other workbooks. When you consolidate data, you are assembling data so that you can more easily update and aggregate as needed. There are two ways to consolidate data: by Category or by Position. Consolidation by position: When the data in the source areas is arranged in the same order and uses the same labels. 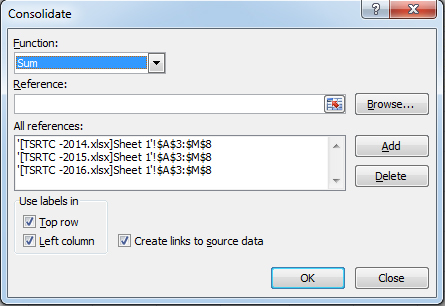 Use this method to consolidate data from a series of worksheets, such as departmental budget worksheets that have been created from the same template. Check the Use labels in option: Top Row, Left Column, Create links to source data and Choose Function Ex: Sum, Count, and Average.